The LeDroit Park neighborhood, located in Northwest DC just south of Howard University, has long experienced significant issues with flooding whenever heavy rain storms overrun its combined sewer system. In 2012, the mayor created a flood prevention task force focused on identifying and evaluating a number of measures intended mitigate flood issues. This project, part of the mayor’s effort, involved the evaluation of a variety of green infrastructure approaches located in the public right-of-way in order to provide medium-term flood mitigation in a 420 acre study area. Street surveys helped the design team to identify 21 strategic locations for green infrastructure interventions throughout the LeDroit Park neighborhood. LAB then worked with other team members to design facilities that would maximize rainwater collection while minimizing cost. 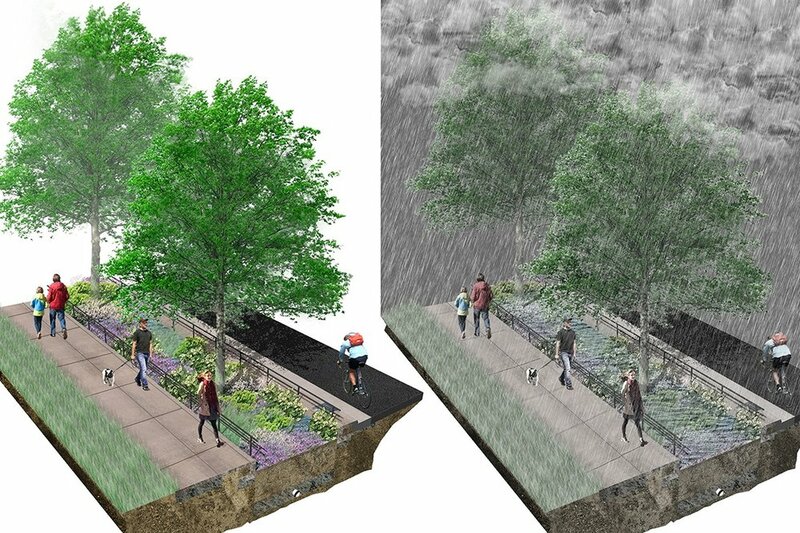 The planned green infrastructure practices include vegetated swales, bioretention planters, vegetated curb bumpout bioretention areas, bioretention in triangle parks and median areas, and permeable pavements in parking lanes, sidewalks, and alleys. This network of primarily vegetated facilities draws on plant community research conducted by the LAB team to best meet the functional and aesthetic needs of each facility. The surrounding streetscape character and street tree species also played a major role in defining the plant palette. Perimeter seating elements were designed at key locations to highlight the potential of integrating social and ecological infrastructure. The LAB team worked with multiple District agencies, including DDOT and DOEE, to coordinate successful design documentation and will continue to collaborate with these agencies throughout construction.